The sun has been shining on Cornwall for the past month resulting in many evenings of alfresco dining, enjoying music in beer gardens and many a sunburnt nose. With July slowly pushing us towards the middle of the Great British Summer, there’s plenty to see, do and take part in while the weather is still glorious! Here are our top five of the county’s events in July. Kicking off July is Cornwall’s most prestigous event – Veuve Clicquot’s Polo on the Beach at Watergate Bay on the 5th and 6th of the month. With three main polo matches over the duration of the weekend, a horse stunt show, Segway polo and live music to keep everyone entertained, this is one Champagne-soaked weekend not to be missed! 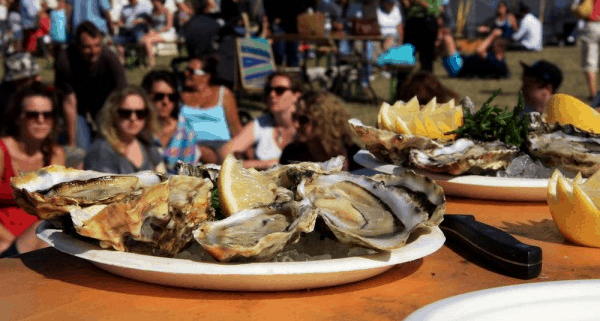 A midsummer celebration of all things foodie and artsy on the 12th of July, the Rock Oyster Festival takes place in the stunning setting of Dinham House overlooking the Camel Estuary. But it’s not all about demolishing as many Cornish oysters as you can, there’s also local live music, a farmer’s market to browse (and taste) and more children’s entertainment than you can shake a stick at. To truly take in the festival atmosphere, book a pitch at the local campsite. From July 21st, let out your inner adventurer at the Eden Project this summer and explore the lost world of the dinosaurs. Dare to enter the home of a T-Rex and immerse yourself in a sensory whirlwind of the past. The exhibition will also feature an extensive collection of dinosaur fossils – including real dinosaur eggs, a fossilised brain, a whole skeleton and a real T-rex tooth. A staple in the Cornish social calendar, the Port Eliot Festival held on the 24th – 27th July is known as a literary festival with everything else thrown in for good measure. The festival is famous for encompassing the relaxed Cornish attitude and has a colourful and vibrant atmosphere that is warmingly infectious. Previous festivals have seen celebs making surprise appearances at this little Cornish soiree, so keep your eyes peeled! July sees the beginning of the Sundowner Sessions on Newquay’s breathtaking Lusty Glaze Beach. With Fisherman’s Friends and The Feeling kicking off the summer’s big acts in July, there are also plenty of free gigs that are the perfect excuse to sit with your feet in the sand at the end of a sunny day on Cornwall’s North Coast. Head to www.lustyglaze.co.uk/sundownersessions/ to see the full lineup and to buy tickets.